Successfully Added Car GPS Navigator - 6 Inch Touchscreen, Wirless Rearview Camera, Bluetooth to your Shopping Cart. The new TR08 widescreen GPS navigator with wireless rear view camera comes with a colorful menu display that is accessed with the use of your finger or a stylus thanks to its ultra-sensitive resistive 6 inch touchscreen. 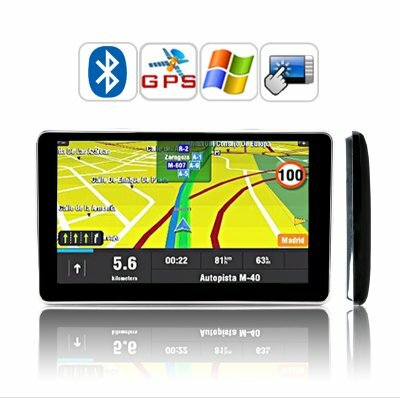 This portable GPS navigator comes with a glossy-black frame along with chrome trimming that surrounds the beautiful 6-inch touch screen. Looking at the unit's left side, you will notice that the SD card slot, which has been standard on the handheld GPS navigators for years has been changed to the more advanced compact form factor micro SD size. This change contributes to freeing up internal space, and next to the MicroSD card slot, are two additional slots that mainstream GPS navigators lack, such as a 3.5mm audio out plug-in and an AV out port for the included wireless camera receiver. It keeps getting better! The menu icons on this GPS hand held navigator come with a graphical refresh unlike tradition mainstream models, and presents a more colorful interface with finer gradients. Meanwhile, the home screen has gained a top status bar displaying status icons for e.g. Bluetooth connectivity, the current time, battery state, etc. This 6 inch GPS navigator comes with a wireless rear view camera that helps you reverse and parallel park with comfort and ease. The wireless rear view camera gives drivers the confidence in reverse and parallel parking. Further-more, installing this wireless rear view camera is easy and takes a mere few minutes. This ip66 wireless rear view camera is designed to be able to handle the harsh weather of the outdoors such as snow, hail, rain and fog. A portable handheld GPS navigator is the way to go! They offer versatility, portability and above all, can be easily taken with you where ever you go. This 6 inch touch screen GPS navigator's FM transmitter along with the Bluetooth feature allows drivers to pair their cell phones with the GPS navigator and enjoy hands free calling and listening to your favorite music through you cars stereo speakers. This 6 inch touchscreen GPS navigator and wireless rear view camera makes a great electronic car gadget for drop shipper’s and eBay resellers. This multimedia 6 inch touch screen GPS navigational unit with Bluetooth and FM transmitter is in stock now, and available at a factory direct wholesale price directly from Chinavasion. on 2011-01-06 01:07:23 It's all ok! Perfect GPS and very speed time to arrive, just 6 day's from order. Arrived, All items were inside as advertised. Works great as a GPS/bluetooth phone transmitter. Very pleased so far-a bargain for a 6" screen! on 2010-10-15 20:58:53 Great Value for Money . Very good signal from the satellites. Very good picture from the rear camera. on 2010-09-21 14:57:59 just received! good one! this is my first time order, and i bought this GPS awesome! with big screen and rearview camera awesome! and got one bonus usb lighter charger! thank you Chinavision! Keep the quality good! more attention to the things. And what i'am confused now is..how to installed the rear camera. haha! overall awesome. this is just for first trying, i will bought more for sale! I am planning to open shop couple next months so support Chinavision. thank you!